This entry was posted on April 13, 2013 by seekraz. 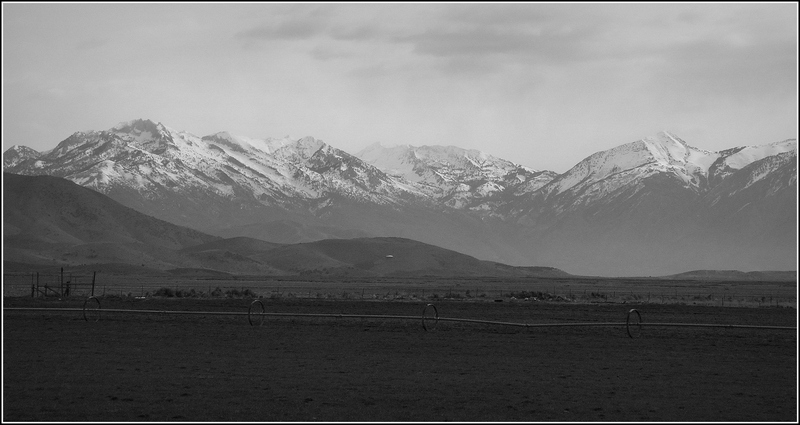 It was filed under Black and White Photography, Cedar Valley Utah, Photos - Outdoors and was tagged with black and white photography, Cedar Fort farm, Cedar Fort Utah, Cedar Valley Utah, Lone Peak, seekraz photography, Utah, Utah County, Utah photography, Wasatch Mountains. Thank you, SP…I think it gives them a different feel in B&W…brings out another quality or aspect. This works beautifully in B&W. The photo really engages you. Great use of black and white. Thank you, Charlie…I don’t use it often, but I find that it does work nicely sometimes. This has a soft subtle beauty to it with its muted tones. Not all images need drama, and this one is quite at home without it. Mountain landscapes (like the territory itself) are often like this – slightly forbidding. I like your description and explanation, Andy…very much. Thank you. Really lovely tones here. Beautiful. I like the way the irrigation mechanism (I don’t now what those are called) connects the mountains to the human realm. I think you named it well, Lynn…and yes, just a hint that we’ve been there…..